They are ethnic comedians. Wait, one's a tap dancer, too. Well, some kind of dancer, maybe something ethnic. I can't tell. Now the other one's started playing accordion standing on a chair. This is more like it - some rip-roaring stuff. They sing songs, too, in a Värttinä kind of style. 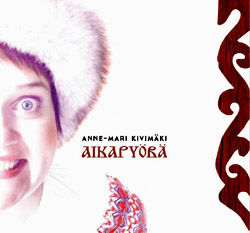 That was my first impression of the twin talents of Puhti (Anne-Mari Kivimäki & Reetta-Kaisa Iles) at a "Rustic Folks' Night" a couple of years ago, the same night I saw Pekko Käppi for the first time, I believe. A year ago I saw them again at an outdoors shindig, where they did mostly instruction at community dancing and singing, preparing for other acts like Aalto. Some songs and accordion, too, but at this stage, my overview was still pretty vague, because I'd only seen a couple of their videos like the wonderful "Sipiläs" featuring Pekko Käppi in a cameo acting role. With these two records and some serious web searching, my picture is now almost crystal clear. It will no doubt become even clearer in a couple of weeks' time, when I will see them at a proper gig for the official launch of Pahan laulu. They have been performing for 13 years, from early days in academia and then leading to master's degrees in music and dance, and there is a doctorate looming for accordion wizard Kivimäki. These records actually form the first two parts of "Suistamo Suite," her thesis to become a Doktor Of Musik. I declare, this is serious stuff. Well, maybe not too serious, but pretty intense. I remember being startled to hear Aikapyörä ("The Wheel of Time") on our editor's American radio program, with an archive recording of the gentle voice of Ilja Kotikallio explaining the ancient Karelian ritual of washing a corpse before burial. It is followed by Kivimäki's techno-inspired interpretation on accordion and drum samples. Could it be a disco hit? "Kamoilla/Ruumiinpesu - At the Graves/Washing the Dead"
If not, then "Kankkuspäivästä Karjala" could be the one to chart or move you to the dance floor, with lyrics that appeal to we Finns' thirst for beery hangovers and Karelian memories. "Kankkuspäivästä Karjala - From Katzenjammer to Karelia"
Another very appealing track on Aikapyörä is "Palje," its hypnotic pulse reminding me of the wonderful Ukrainian group DakhaBrakha's mystical video "Vesna." The connecting link might be her current preference for two-row Russian accordions, with their basic, hard-hitting sound. A contrasting pair of moods are offered by the boisterous "Bileet" (Party!) and the ethereal "Surua" (Sorrow). Like all the tracks, they combine traditional-sounding melodies with a fresh and modern approach to striking the accordion keys. These are all Kivimäki's original compositions, with significant nods to many different forefathers. "Rauha ja hiljaisuus" (Peace and Quiet) features one the few vocals in the set, with beautiful trumpet added. This is the kind of music that reflects the movement (or non-movement, as the case may be) of a Finn's soul at sunset, as she or he sits still steaming on the verandah of the lakeshore sauna, sipping a beer, looking at the calm lake and listening to the songbirds. 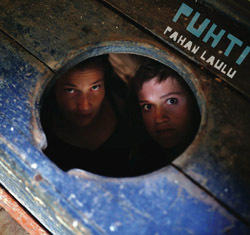 "Rauha ja hiljaisuus - Peace and Quiet"
The second part of the "Suistamo Suite" is Puhti's Pahan laulu ("The Song of Evil"). It opens with a list of colorful names for the devil, accompanied by an ominous rumble of the bellows and percussion, and an equally ominous accordion riff. Next, "Daddy Cool" portrays the demon in a playful mood, dancing the night away. "Isles of Hell" is the first vocal showcase for Reetta-Kaisa Iles, with Matti Laitinen assisting on ringing kantele. "Helevetin Saaria - Isles of Hell"
"Hutjakka" offers a heavy-duty disco sound with Russian overtones and then "Jumala rankaisee" is our obvious hit single, if there's any justice in the world. Well, we all know there isn't, but we can still enjoy the tight duet vocals and its driving intensity. Very little modern technology is needed here. Its lyrical theme is ages old: "You can try to run and hide, but God's wrath will come upon you!" "Jumala rankaisee - God's Gonna Cut You Down"
© 2014 RootsWorld. No reproduction of any part of this page or its associated files is permitted without express written permission.